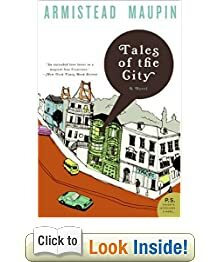 Well, for starters, the opening line of Tales of the City by Armistead Maupin did not give away much of the plot or provide much of a thesis for the story as other novels usually do. The opening line, does however lay the setting for the novel. San Fransisco, and as you keep reading, you find that it is San Fransisco in the 1970s. Although the story starts with Mary Ann’s decision to move to San Francisco at age 25, leaving her home in Cleveland, she is not the central character in this book. San Francisco is a city filled with friends-of-a-friend, that seem to be loosely linked to Mary Ann in one way or another. The central characters revolve around the residents of 28 Barbary Lane; Mona, Brian, Michael (also known affectionately as Mouse), and their landlady, Mrs. Madrigal. As the first book in a series of seven books, Tales of the City simply sets up the scene and characters. For the most part, this book is story of a group of 20-year-olds looking for love, gay or straight love, in San Francisco. There are no clearly defined good guys or bad guys, there didn’t seem to be much conflict or climax in the first book. Towards the end there was a mystery revolving Mary Ann and one of the tenants, Norman Neal Williams, but I felt that the ending wrapped up a little too neatly and the mystery wasn’t very well laid out. There characters are all pretty self-involved, so there wasn’t any one character that stood out from the pack. However, I was interested enough to read the second book in the series, More Tales of the City. I am very glad I kept reading because the sequel is more detailed and well formed than the first book. That just leaves me to confirm that the first book was meant to be an introduction to the characters, and the mysterious Normal Neal Williams was an added element only to create some form of conflict in an otherwise plain story of finding love and acceptance in the city. Each chapter is about two to three pages in length, and tells the story of one of the ten main characters. The characters range from all sorts of personalities and ethnicities that seem to be the core representations of San Francisco. The hippie feminists, the closet gay men, the openly gay men, etc. My only complaint with the book is that it was written in the 1970s, so therefore, many of the pop culture references, and there were many, would frequently go over my head, so I’d have to stop reading and look up the actors, plays, musicals, scattered throughout the novel. If you lived in San Francisco in the 70s, then this would be a choice read, as you will recognize the locations and many of the references Maupin refers to throughout the course of the novel. This entry was posted in Adult Fiction, Books and tagged Armistead Maupin, Book review, San Francisco, Tales of the City. Bookmark the permalink.